Alaina Gates is a licensed veterinary technician at Veterinary Medical Center. She is a graduate of Wilson College and holds a Bachelor of Science with a minor in biology. Alaina's responsibilities include prepping animals for surgery, placing IV catheters, assisting our veterinarians during appointments, and working in our in-house laboratory. Alaina has a cat and tropical fish. In her free time she enjoys gardening and spending time with her husband and two daughters. Julia Carr is a veterinary technician at Veterinary Medical Center. Julia joined the VMC team in November 2014, and her responsibilities include general patient care, taking x-rays, collecting blood, stool or urine for laboratory testing. She received her Associate's Degree in Veterinary Technology from Harrison College. Julia provides Veterinary Medical Center with a unique ability to stay calm in stressful situations, as well as a professional flexibility that allows her to help in a variety of settings. At home Julia is the proud parent of a cat named Arya and a dog named Auggie, who lives in Indiana. During her free time Julia enjoys spending time with her family, as well as reading, music, and outdoor activities like hiking or kayaking. Amy Amick joined Veterinary Medical Center in December 1992. Amy is responsible for assisting our veterinarians with surgery and appointments, along with keeping our kennel areas clean. "I enjoy working here because it's more of a family atmosphere than a job," says Amy. "There are a lot of nice people that come through here, and I enjoy getting to know them and their pets." Amy has a dog named Hank and three cats: Chucky, King Buddy Tut, and Sting. In her free time she enjoys basket raffles, yard sales, shooting pool and working around the house. Chana has been a veterinary assistant at Veterinary Medical Center since November 2011. Her job responsibilities include prepping for surgery, monitoring anesthesia and assisting veterinarians during appointments. "Everyone at Veterinary Medical Center is like a little family," she says. "We all have the same goal: to make the lives of animals better." At home Chana has a dog, two cats, and a horse. In her free time she enjoys spending time with her family and boyfriend and horseback riding. Veterinary assistant Jessica Cessna joined Veterinary Medical Center in 2001. She is responsible for assisting our veterinarians with appointments and surgery preparations, cleaning kennels, and taking x-rays. Her favorite part of her job is interacting with clients and their pets. Jessica has two cats, a dog, and four quarter horses. In her free time she enjoys trail riding with her husband, attending her son's baseball and soccer games, and taking walks with her two boys. Veterinary assistant Tara Crawford has been a member of our team since August 2013 and has over seven years of experience in the animal care field. Her responsibilities include drawing blood, taking x-rays, assisting with veterinary appointments and feeding and bathing our boarders. "This is where I want to work until I can't work anymore," says Tara. "The people I work with motivate me to do the best that I can." Tara has two cats, Emma and Pebbles; and a dog, Alice. In her free time she enjoys spending time with her boys and her grandson, camping and fishing. 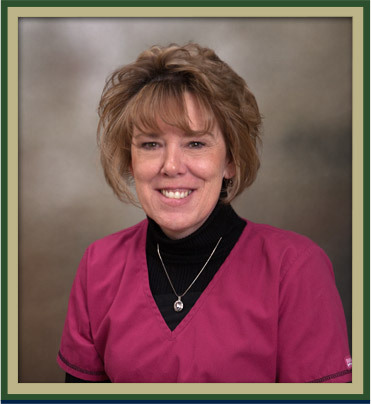 Natalie Buchanan has worked at Veterinary Medical Center since October 2000. Her responsibilities include scheduling appointments, checking clients in and out of the hospital, ordering inventory, payroll, and "anything else that needs to be done!" "I love working here because no two days are the same," she says. "We have a small staff that enables us all to get to know one another, and it feels like an extended family." Natalie spends her free time with her family, including her three grandsons. She also enjoys watching football and going to baseball games. 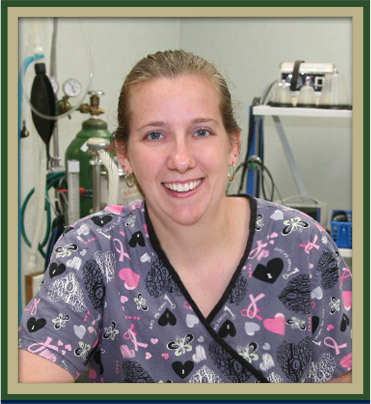 Gina Shaffer joined Veterinary Medical Center in March 2013. As one of our receptionists, she is responsible for answering phones, greeting clients and their pets, and scheduling appointments. "Our clients, the veterinarians and my co-workers make Veterinary Medical Center a great place to work," says Gina. "I learn something new here every day." Gina has two beagles named BeBee and Duke and enjoys riding motorcycles in her free time. 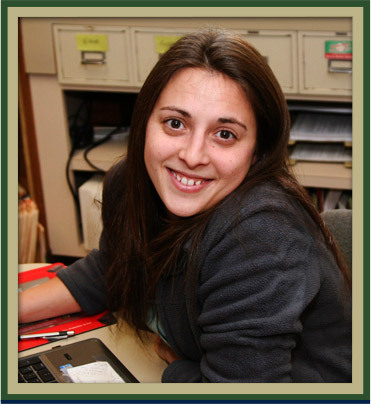 Receptionist Megan Thimons joined the team at Veterinary Medical Center in August 2014. 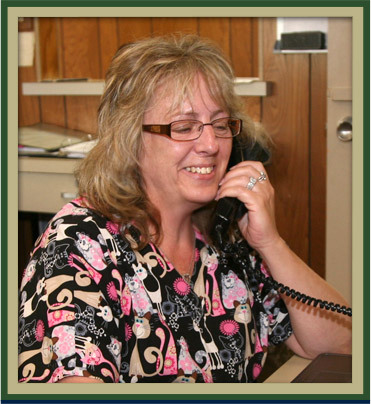 She is responsible for answering phones, checking clients in and out, and filing records. The part of her job she enjoys most is the chance to interact with and assist a variety of clients and their pets. Megan is also a regular volunteer at the Bedford County Humane Society, and she enjoys spending her free time with her kids and her soon-to-be Husband. She also loves hunting, fishing, four-wheeling, and nearly anything else related to the outdoors.